The Mackinac Bridge connects the lower peninsula to the upper peninsula. For me, it’s also a connection from home, to school, here at Northern Michigan University. A year ago this weekend was when I first toured campus. I remember going over the bridge and having the feeling that I’d be making this trip next August. It gave me a sense of comfort and excitement at the same time. Every time I go across the bridge it’s an amazing experience, I feel like I’m on my way to where I should be going. It lifts me up and gives me an adventurous feeling, I can never be driving over the bridge in a bad mood. I feel lucky to be able to travel across such a monumental bridge. 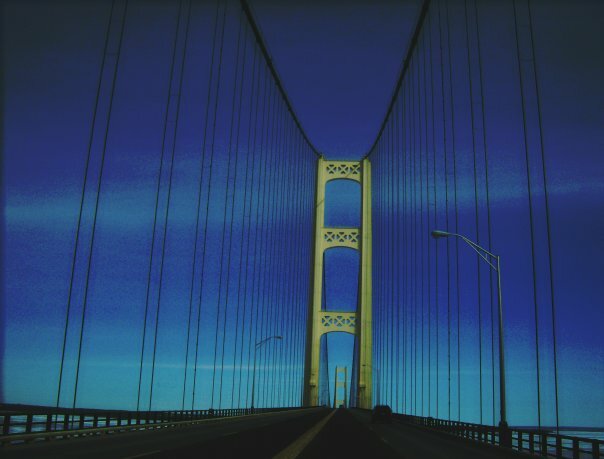 The Mackinac Bridge is my image of the week because of the I feel when I go across it and because it inspires me to do well in school, so I can enjoy these feelings for years to come. This picture is from my own photo album. I LOVE the Mackinac Bridge! I usually go over it at lease once a year because my Grandma lives in Detroit and I live in Iron Mountain. I love crossing it at night when its all lit up. Its a beautiful landmark to me! The Mackinac Bridge is truly amazing. I get some different feelings though, such as insecurity. When you go across the bridge on a big charter bus, and the wind is blowing so hard you can feel the bus swaying back and forth a long with the bridge itself, it’s a little scary sometimes. Here’s a fun little fact for you, the Mackinac Bridge actually moves 10-12 feet in either direction. Although it is five miles long, it never feels like it’s that long to me.